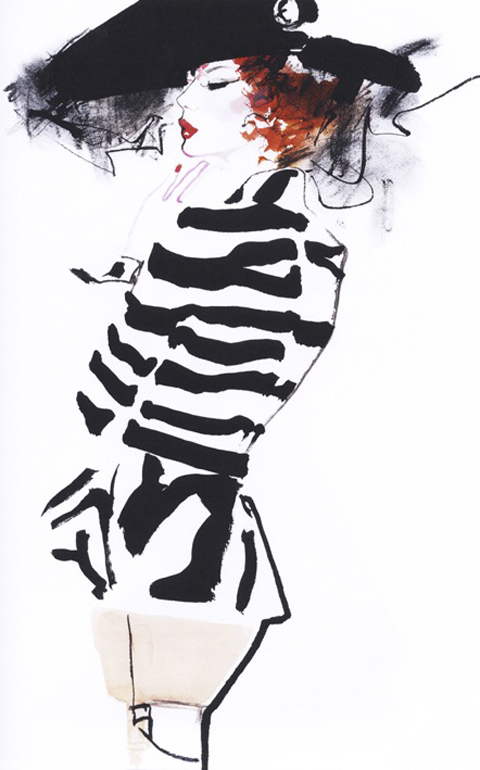 David Downton is one of the most prolific living fashion illustrators, sickness and by far my favourite (no offence, healing contributors!) His loose, dosage visionary style seems so effortless and radiates elegance and beauty. Beginning his career as a commercial illustrator, it wasn’t until he attended Paris couture shows over a decade ago that he really began to explore fashion illustration. Since then, he’s created images of the world’s most groundbreaking fashion and its most beautiful women. From Dior to Dita Von Teese, he’s captured the essence and spirit of women and fashion like no other image maker before him. His images are everywhere, in books, in magazines, on billboards, on the walls of illustration students’ bedrooms and hell – even M&S tote bags. 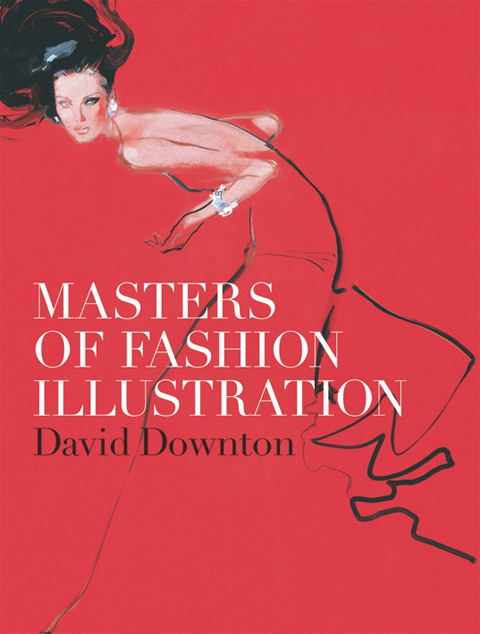 This month sees the launch of Downton’s first solo book – Masters of Fashion Illustration. Inside, it explores the work of the greatest fashion illustrators of the twentieth century as well as a good look at his own work. You’re in for a treat here – page after page of lavish images celebrate the genre, featuring the greats of fashion illustration as well as looking at the influence of other artists and designers. Hi David! I’m worried about asking all the questions you’ve been asked already… but… How did you become a fashion illustrator? In a way, I was ‘mugged’ by fashion. 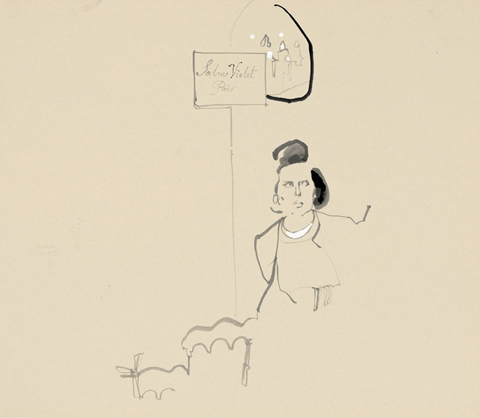 I was fairly well established as an all-round commercial illustrator – who occasionally took on fashion commissions – when the FT sent me to Paris to draw at the couture shows. That was in July 1996 and I felt like I’d been given the keys to a magic kingdom. How do your pieces come together? Surprisingly slowly. I keep working until it looks effortless, which means doing a lot of drawing. I am looking for a kind of controlled spontaneity. It really depends on the brief, my mood and what I am trying to convey. I love using Rotring ink, because it is such a rich black and Dr. Marten’s black ink, because it has a velvety, violet cast to it. I also use gouache, watercolour, oil stick, occasionally acrylics… really anything that seems appropriate or inspiring at a given moment. 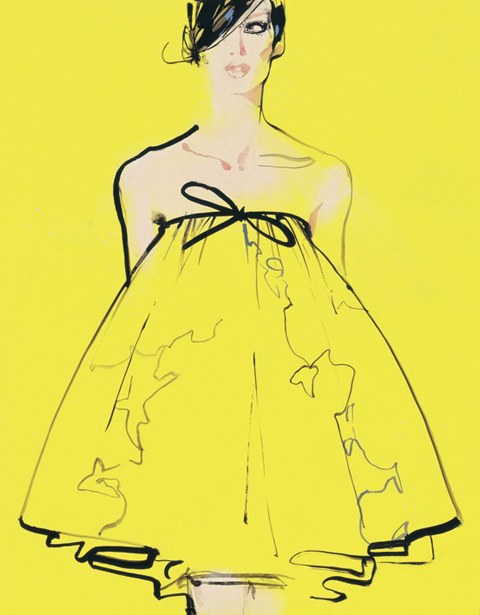 What qualities do fashion illustrations have that photographs or film don’t? A personal sensibility (very few illustrations are the result of a team effort). A sense of the moment, fluidity, dexterity. Drawings tell the truth without needing to be accurate. The camera is a gadget (and we all love gadgets), but we have been saturated by photographic imagery. It’s a point and shoot world. Who has been your favourite subject to draw, portrait-wise? In no particular order: Cate Blanchett, Dita Von Teese, Erin O’ Connor, Paloma Picasso, Lady Amanda Harlech, Linda Evangelista and Carmen. I’ll stop there, but the truth is, everyone I’ve drawn has been inspiring. Which designers are your favourites to illustrate? Lacroix, Dior, Gaultier, Chanel, Valentino…. the masters. Which other image makers have inspired you/do you admire? Again, too many to list fully. How about Matisse, Boldini, Picasso, Francis Bacon, Euan Uglow, Réne Gruau, Mats Gustafsson, Tony Viramontes, Abraham Ganes, Al Hirshfield and Bob Peak to kick off with? How do your collaborations come around? It depends – sometimes I think of a project I’d love to do and pursue it…. At other times it comes to me, either directly, or via my agent. There are no hard and fast rules, but I’m always trying to scare something up. 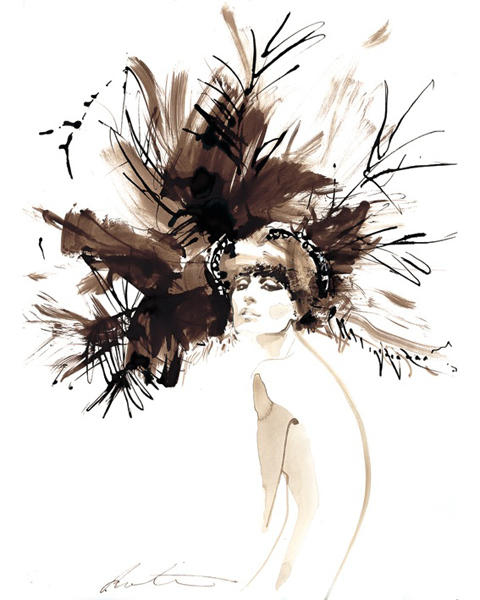 Here at Amelia’s Magazine, we love fashion illustration and Amelia’s next book will be a celebration of the genre. What advice would you give to our army of up-and-coming illustrators? My advice would be simple; keep drawing. You can’t be too good at it. And when you’re not drawing, keep looking, training your eye. Be professional. Fashion illustration is a profession, as well as a passion. Most of all enjoy it; you have the whole world at your fingertips. There seems to be a real revival of fashion illustration at the moment – magazines and websites are showcasing sketchbooks and commissioning more and more illustrators and exhibitions are popping up everywhere. Why do you think illustration excites people? I was once working backstage at Dior and a model said “Drawing… wow, that’s new!” I thought, ‘drawing is now so old, it’s new!’ In other words, like everything else it’s cyclical. I think a lot of people just forgot about it. But, to be honest, although everyone talks about a revival, fashion illustration never really went anywhere. Perhaps you just needed to look harder. Will you ever use a computer as part of your imagemaking?! Never say never, as they say. What can we expect from the new book? It’s beautiful! Gorgeous! A celebration of my favourite fashion illustrators from the turn of the 20th century up until the late 80s, followed by a portfolio of my own work. How did the book come together? Did you enjoy creating it? I worked very closely with the designer, Karen Morgan, and loved every agonising minute of it! It was a big leap for me. I’d done 2 issues of my own fashion illustration magazine Pourquoi Pas? and I thought I knew what I was doing, nevertheless it was daunting to do a 240 page book in my ‘spare’ time. But it was a labour of love; I got to look at the the work of the artists I most love; I met Tony Viramontes’ brother and René Bouché’s widow; I had access to the Vogue archive. I have to say, the publishers (Laurence King) were brilliant, very indulgent and I think we are all proud of what we achieved. So, what else do you get up to? I have two teenage children (actually my daughter’s 20, now), so all the usual things. I’m a lazy workaholic. When I’m not working I am very happy doing ‘nothing’. I live in the countryside an hour from London; a long way from the world of fashion. David will be giving a talk at the London College of Fashion on Thursday 9th December. Keep an eye on our listings section for details soon! 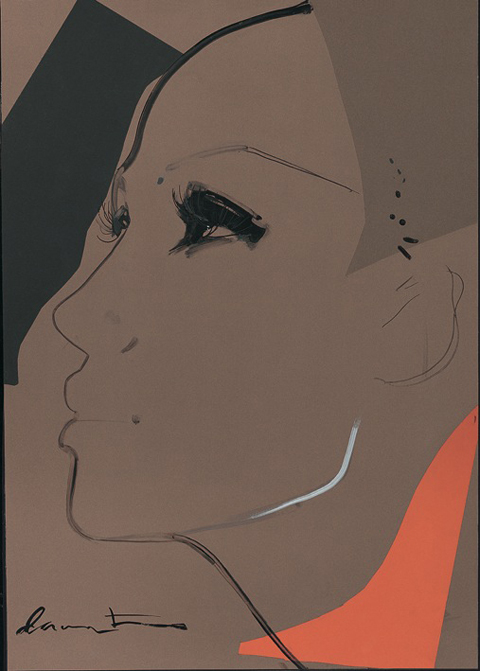 Masters of Fashion Illustration by David Downton is out now, published by Laurence King. 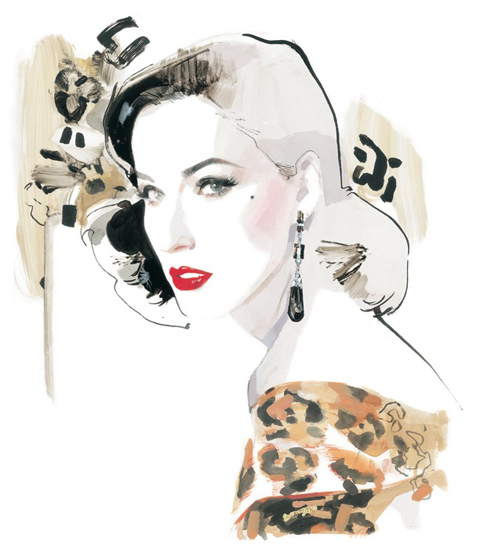 All images courtesy of David Downton. This man is one of the reasons I went to uni to study illustrations. My sole reason for trying to become a fashion illustrator. He is what I strive to be as an illustrator. Effortless, beautiful. His work made me choose Fashion Illustration as a course. Best decision I ever made! Amazing, effortless, every line is thought through. He’s one of the reasons why I want to pursue my fashion illustration career! Fantastic work ….by far my favourite illustrator. I love the way he makes it look effortless when we all know its not. Love the striking colours he sometimes uses too. Doing fashion illustration as part of a varied art & design course.